Looking for a Barcelona SEO Expert? I'm the one who will take your Barcelona pages to the next level. I'm talking about visibility, traffic, leads and sales (SEO conversions). I have a unique SEO strategy that produces great results in Google search, Google Maps, and YouTube. 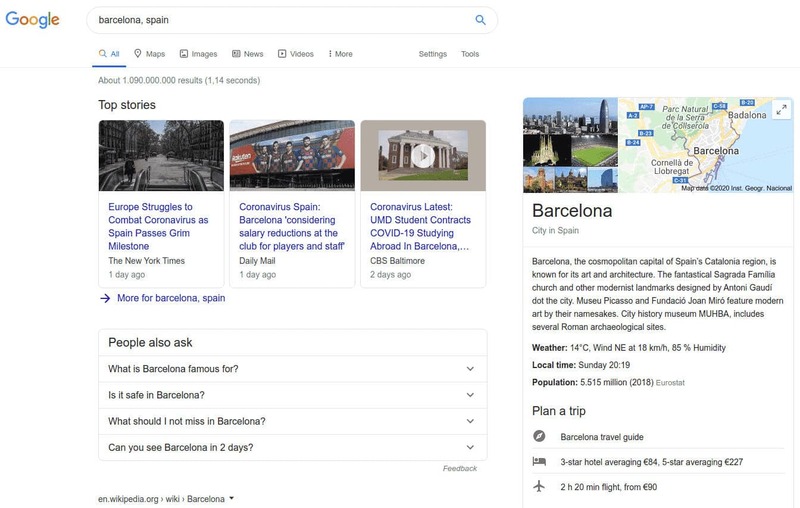 Grab this unique opportunity to rank on the Google First Page for Barcelona terms. I will need a few weeks to get things rolling. With big projects, I need six or more months as I work with many search terms. Over ten years of SEO experience will get you the quality traffic you need. You can have your pages ranking in Google Search, Google Maps, YouTube, etc. SEO is one of the few free traffic sources, and Google waits to host your pages on its first page. To rank a page, you need to have the skills or hire someone to do it for you (SEO Expert). Apart from that, the search engine placements are free. Another advantage is the enormous traffic that you don't see in paid channels (Google Ads) or Social Media. A project may take up to six months, but competitive niches take more time to see the placements and growth. We call SEO conversions when page visitors take action on a landing page. For SEO conversions, you need the best visibility, quality traffic, and optimized content. Content is key as it triggers the clicks right from the search result pages. Optimized descriptions attract clicks to visit your pages. So, visibility and traffic are not enough if they don't convert to leads or sales. My unique strategy works in any niche generating quality traffic. What I mean by that, is visitors to your pages who are looking for a solution or a product (buyers, subscribers, etc.). My method targets real visitors and doesn't use any bots, automation software, or PBNs. Google updates its engine all the time, and demotion is an actual risk. But with my strategy, you are confident of your positions, seeing them getting better. I optimize your content for the best visibility and quality traffic. My SEO plan brings you growth with no risks. You will discover me being a reliable growth partner.